Guinea is a West African state on the Atlantic coast which is divided into four ecozones: Lower Guinea on the Atlantic coast is extremely fertile; in the mountainous region of Central Guinea a moderate climate prevails; Upper Guinea is characterized by dry savanna land; and tropical rain forests can be found in the outermost southeastern part of the country (Forested Guinea). One of the greatest challenges facing the people in Forested Guinea is a sufficient supply of drinking water. Water holes are normally far away which means that women and young girls have to cover long distances to reach them. 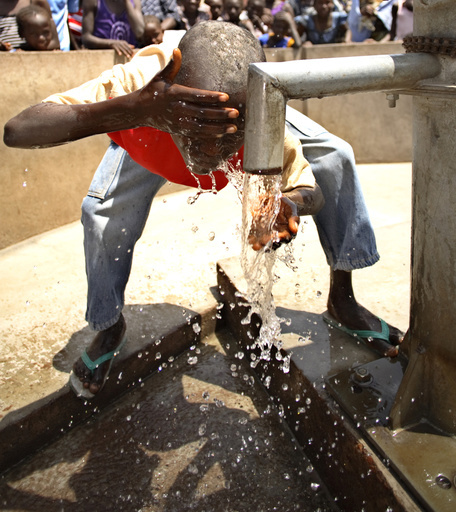 The water in the wells is often heavily contaminated which leads to diseases such as cholera and infestation with parasitic worms. Plan International is pursuing the objective of ensuring a year-round supply of drinking water in the forest region of Guinea. Between July 2003 and October 2007, a project to improve the quality of the water supply was implemented, to which Arthrex contributed 29,000 Euro. The new water supply stations allow people easier access to clean water. This has a positive effect on the health of the children and their families. Every well has been built so that women and children can fetch water easily. In addition, awareness has been raised among the population about the link between clean drinking water and hygiene and health with the aim of identifying and preventing the spread of illnesses and epidemics. By involving members of local communities in the construction of wells, they have learned to take responsibility for maintaining the water supply stations themselves, which guarantees the long-term success of the project.